What has been the biggest challenge to overcome as the youngest Councillor on the Rodney District Council? I think it is my own perception that I am being watched. Everyday I am surrounded by people I consider to be Auckland's top leaders, lawyers, planners and media whilst being in the face of the public, facing criticism and ridicule ... phewwww. I wake up some days and just feel like the Red Beach boy who left home at 17, came back with a degree and some life experience and found myself around the table making decisions on the community's behalf. However I love this pressure and my own perception is the foundation by which I prepare. I liken it to when I was competing at the World Jet Ski finals. When I was on that start line I knew my team was more prepared, we had worked twice as hard, my fitness was better than anyone else's, and the results showed this. 2. What do you find most rewarding or inspiring in your role as Councillor? Working under the people. It is inspiring to me when I am engaging with a wider range of people (particularly younger people) who get passionate about particular issues. And then taking this information and really showing the other decision makers that this is what my community thinks and wants or needs. What originally motivated you to go into politics / run for council? I had finished uni and was working in property. I was dealing with the council and ripping my hair out, and on the back of this I saw potential in a local community (Orewa Beach). So being the first one to pay the council out, my boss asked "Why don't you run for council?" - long story short, I found myself as the youngest ever elected in Rodney and the highest polling by a long shot (only 500 votes for the Mayor who pooled from a far bigger area). Who or what inspires you, and why? How has this helped you get to where you are today? Books, movies, music, theatre, people - all of these in no particular order. A few things in the last couple of years have really put things into perspective for me, and I am determined to make a mark for the better before I die. I love putting myself in other peoples shoes and trying to see how they tick. Live a day in their shoes and go into things with a real open mind. An old flatmate of mine in Palmerston North once said this about music: "All music is good music". At the time I was so stuck on one genre that I wouldn't even consider another, I couldn't appreciate another. The next day I went out and bought some Frank, classical mixes, Indi, death metal etc and sat down and listened. I really feel like this has set the tone for how I have tackled things across the board. 5. Now that we are halfway through 2010, what would you say have been your biggest achievements this year to date? And what are you most looking forward to in the remaining months of the year? Professionally: The re-development of Orewa Boulevard, Estuary Walk/Cycleway and helping Youth Centre get back on their feet. Personally: Becoming more independent, keeping my dog alive and truly appreciating my friends and family. How do you maintain the all important work-life balance? I find this particularly hard. Especially being in what is known as 'the public eye'. I am a real extremist. I love to work, and probably work too much. I also love getting lost with my friends and probably do this too much as well. I love being around people but then I also love 'me time' at the beach or at home with my dog. I love the feeling of being out of control, but in a controlled environment - organised chaos perhaps. What has been the biggest learning curve for you since taking on the role of Rodney District Councillor in 2007? In council, you can't please everyone. What inspired you to start the website www.getinvolved.co.nz and how do you see the site developing? In the past I have been of the centre-right orientation however the last three years in council have opened me up to new appreciations. This career entails being something of a socialist, and when my friend Carl Thompson came to me with the Get Involved idea it ticked all the boxes. The website doesn't cost anything and it is a simple way of making a difference in the community. You can be as involved or uninvolved as you want, but there is a solid foundation of environmental information that anyone can to tap into. We really aimed this at people who don't usually get involved, and by our style and social media integration we are achieving this. You have connected with the people of your community via social networking sites such as Twitter and Facebook, how has this been advantageous to your role of Councillor particularly now that you are campaigning again? Social media has been the best way to keep in touch with my community. For the last two plus years I have been using social media to get a 'real' gage of the community. I started the Hibiscus Coast group on Facebook a long time ago, and to date this group boasts 2500 plus members. To me this is something of a new-age Rate Payer group. Too often at council we have a couple of people turn up claiming to be representative of the whole community because they are under some incorporated title. In my opinion the days of people going out to these meetings and events (which are generally created by politically driven people) are over. Over the last two years I have been able to bring issues to these members at the touch of a button. Overnight I can receive hundreds of submissions and opinions from a part of the community that never otherwise engage with council. They come from a very wide range of occupations and stand points - straight from the horses mouth and not influenced by others. Your previous achievements in jet-ski racing and motorsport dictate that you have a competitive streak, how has this given you an edge in getting to where you are today? I think it has definitely helped. Competing taught me to work hard for the desired outcome. I have learnt about sacrifice and doing the best with what you've got. Second place is the first loser, and to me failing because you know you didn't put everything into it is the definition of disappointing. When asked this it is actually a quote that comes to mind: "Don't let other peoples opinions shape your reality" - Les Brown. "refreshingly passionate perspective"? - sounds like a something from a graduate CV to hide a lack of experience. 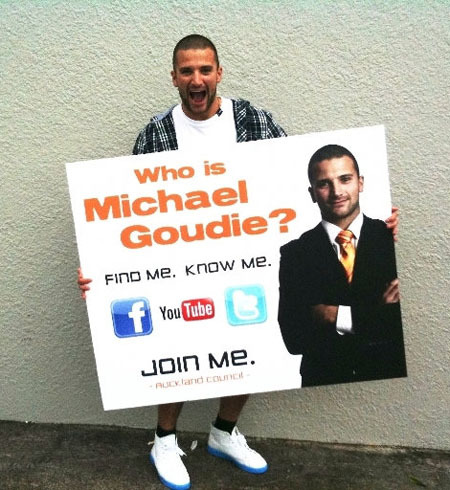 Goudie sounds like a good guy, but Auckland needs better! To me it sounds like he just did his apprenticeship and now he's ready for the next step. Experience that comes with age has proven time and time again that its not the answer. Good luck MIchael, the more people we have like you on board the better. Top Bloke, Maturity beyond his years and adds voice to a generation that need to be heard in Auckland!!! Go Michael! Incredibly inspirational to say the least - I'll be watching him with eager anticipation to see what he does next!! What one says and what one does are two totally different things, i've yet to vote for someone who actually follows through with what they've said they will. Once in its 'lets vote ourselves a pay raise' and 'forgot' all our 'promises'. I haven't decided who it is i will place my vote for yet but it will take more than 'will dos' i want to see some action.